In 1955, in the back pages of the Batman focused Detective Comics, a new superhero was introduced in a story titled “The Strange Experiment of Dr. Erdel.” Dr. Erdel was a Chicago based astronomer who has constructed a device to communicate with the planet Mars, which Erdel believes is inhabited. The device malfunctions and accidentally teleports a Martian to Earth. Erdel is so shocked by this he has a heart attack and dies leaving the confused Martian alone on this strange new world. His Martian name is J’onn J’onnz and, due to his ability to shape shift, he takes the alias John Jones and fakes credentials to become a police detective in the Windy City. 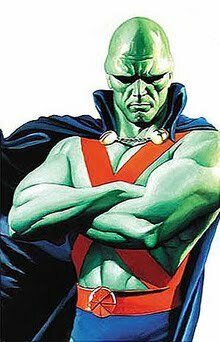 J’onn would keep his Martian identity secret for many years, using his telepathy, flight, and ability to phase through solid matter to foil criminals without them realizing it. But, he could only hide for so long. J’onn’s big public debut came with the formation of the first Justice League of America. 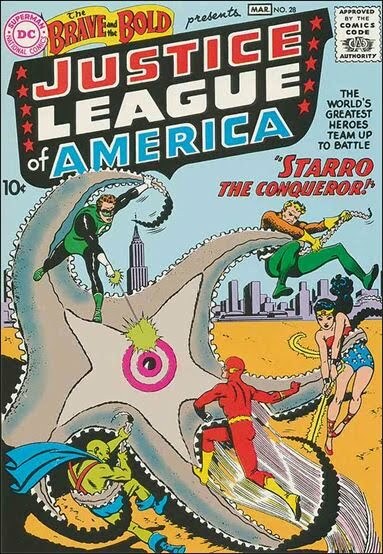 The mind controlling alien Starro attacked the Earth and the greatest of Earth’s heroes came together to stop it (Superman, Batman, Wonder Woman, The Flash, Green Lantern, Aquaman). J’onn joined their side taking a more humanoid form, but keeping his alien nature through his green skin and the symbol of his home planet on his belt. J’onn was to become the most stable member of the League, being a member of every incarnation that followed, except for the current version. During this time J’onn yearned to return to his home world and be reunited with his wife and daughter. Eventually, this wish came true but what he found broke his heart. It seems that Erdel’s device had not simply transported J’onn to Earth. It had pulled him through a thousand years of time to the present on our planet. J’onn learns that the civilization of Mars had been destroyed in his absence, a few red dust covered ruins remain. He returns to the Earth for good and helps form a new Justice League alongside Aquaman, becoming very attached to his team members which are his makeshift family. The villainous god Darkseid decides to test the mettle of Earth’s heroes around this time and in the aftermath many of the members of the League are killed. J’onn is lost in the world until businessman Maxwell Lord brings him in to help lead a Justice League International. The alien hero takes the position and becomes a sort of makeshift den mother to this group of goofy characters, particularly keeping Blue Beetle and Booster Gold out of trouble. Now relaxed in his new position, J’onn allows himself to shift into his natural Martian form during meditation and also reveals his proclivity for Oreo cookies. A major turning point occurs for the character when the old Justice League villain Despero comes to Earth wanting to mindlessly kill his old adversaries. Despero attacks the former League-r Gypsy and kills her family. He goes on to kill a few other members, until J’onn steps up unleashing a psychic assault on the villain that fools him into thinking he has won and sends him into a hibernation state. 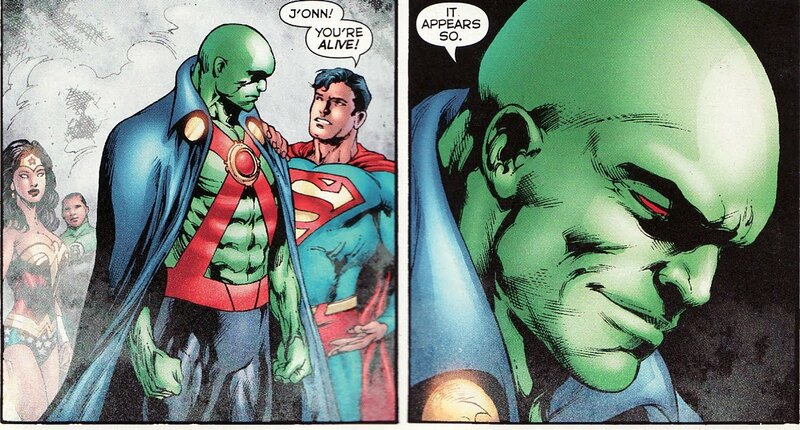 J’onn felt himself growing distant from his team around this time, and goes on leave. As he heads for Chicago, he runs across an African-American man being attacked by a strange entity. Through bizarre arcane rituals, J’onn and the man merge into a being known as Bloodwynd. J’onn’s memories are scrambled and Bloodwynd ironically ends up joining the League. He participates in the battle against Doomsday, the monster who would eventually kill Superman, and is injured. These injuries lead to J’onn’s memories returning and he and the man split back into their individual forms. The Martian Manhunter retained a steady place with the League in the following years, learning more about the mythology of his home world and even battling the Martian version of the Bogeyman, Fernus. On the eve a great crisis, J’onn was busy with monitor duty at the League’s moon-based Watchtower headquarters when a shadowy figure attack and caused the building to explode. J’onn was believed dead but is actually being used by the crisis’ key villain, Alexander Luthor (son of another universe’s Lex) as a living battery to collapse all parallel realities into one. With the help of Superman, Batman, and Wonder Woman, J’onn escapes and the young Luthor is defeated. Months later, J’onn is injured brutally by the villainous Black Adam and suffer severe psychic trauma. He gives himself a new form, more reminiscent of his natural alien form. 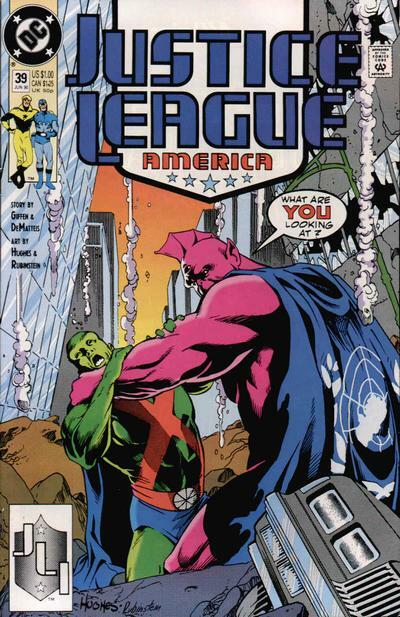 Tragically, J’onn is killed by Libra, a cultist obsessed with bringing about an age of evil on Earth. When the Blackest Night occurred on Earth, black rings falling from the sky and resurrecting the dead, J’onn was one of those who attacked his former friends. The rings had a corrupting influence on their hosts so it was not truly J’onn speaking through his body. Thankfully, Green Lantern and his allies managed to stop the influence of the black rings through the presence of a white energy. The white energy cause J’onn among others to come back from the dead. The alien has now returned to Mars, rebuilding its surface, but has recently experience phantom memories from his past that seem to tell him he is not the only Martian still alive. Here’s an entry from DC Comics’ Vertigo imprint. 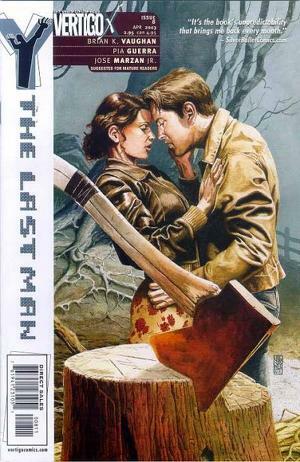 Y the Last Man ran from 2002 to 2008 and was written by Brian K. Vaughn, with art Pia Guerra. The covers were provided by the insanely talented J.G. Jones. If you’re a fan of Lost then you’re familiar wit Vaughn’s writing, he was a writer on staff for seasons 3, 4, and 5. He even received a Writer’s Guild nomination for his Season 4 work on the show. 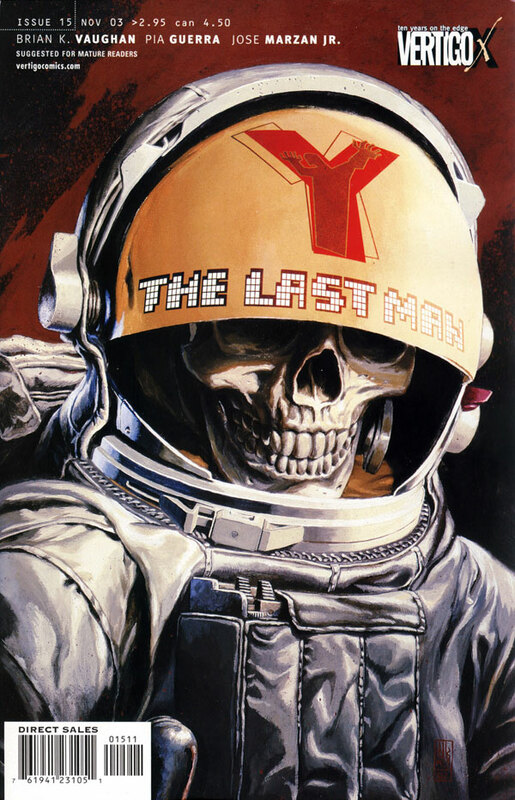 Y the Last Man is one of the comic book series that feels like a perfect framework for a television series as well. 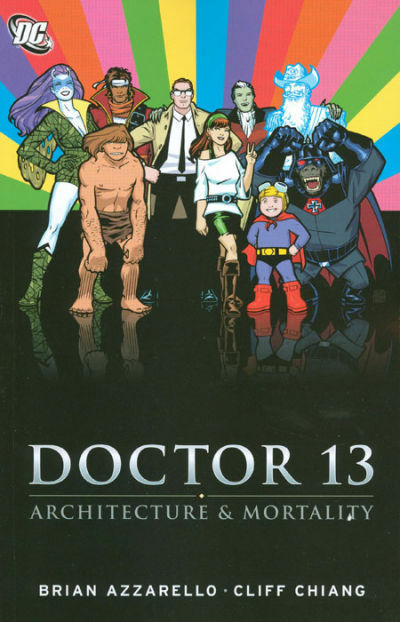 We have a regular cast of characters involved in one large arching story, with small six issues arcs along the way. The series looks at some issues of gender in global culture and is one of those great philosophical science fiction stories. It’s present day, and Yorick Brown is an amateur escape artist practicing a classic Houdini trick while on the phone with his long distance girlfriend, Beth. In the middle of the conversation the world falls apart. It seems a virus has swept the globe in a freakishly quick amount of time killing every male animal on the planet, except for Yorick and his pet capuchin monkey Ampersand. The duo quickly find that the world is both different and depressingly familiar now that it is female dominated. The same sort of tribal mentality that ran patriarchal society is at work in the matriarchy. Some women believe this was an act of god to curse man for his millenia of foolishness. Some women are willing to kill any man they might see alive. Some women see this as biological catastrophe and are working to developing cloning technology to keep the human race alive. Into the mix is thrown Agent 355, a female member of a secret society dating back to the presidency of George Washington. Agent 355 is sent to protect Yorick as he journies from the States to Australia to find Beth. The series has some wonderfully exciting moments. I’m reminded of a subplot that involves the belief that a group of male astronauts in the international space station might still be alive. Teaming up with scientists hiding out in a secret laboratory in the Midwest, Yorick and crew attempt to aid in the crew’s return to Earth. At the same time, a militant force of Israeli soldiers are closing in on Yorick whom they plan on using to reproduce. The Israeli angle is one of many interesting elements in the series. In real life, Israeli is the only military on Earth that have women as an integral part of defense. This means in Yorick’s world, the dominant military force are the Israelis. They are the only ones with battleships and air force pilots. There’s also some interest threads involving the Muslim world and what happens to it in a culture without men. If gender studies is something of interest to you, then Y will definitely leave you with some clever ideas to ponder. 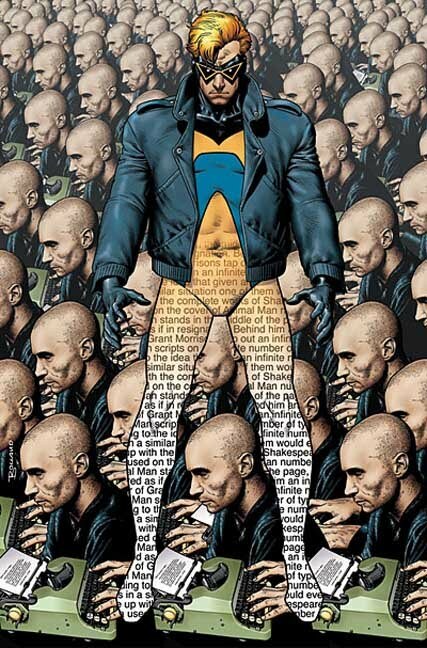 It’s no secret that I love Grant Morrison’s work. He’s like the second coming of Julius Schwartz, the crazy DC Comics innovator of the Silver Age mixed with metaphysical, post-modern sensibilities. Just a year after Watchmen’s publication, Morrison wrote what was in many ways a response to Watchmen’s attempt at realism. 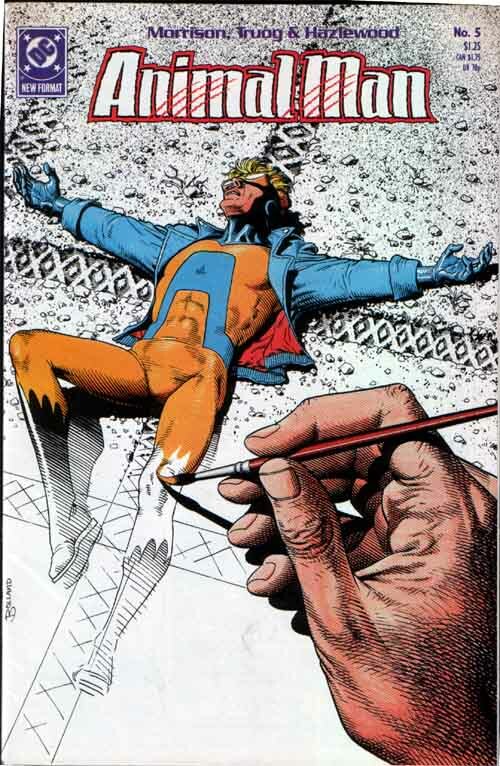 With Animal Man, Morrison created a hyper real look at the comic book reality and its the relation of creator and creation. The fact that these were mainstream comics published by DC, yet so innovative and experimental is amazing. Its hard to see anything like this happening again, though there was a brief attempt with Brian Azzarello’s Architecture and Morality mini-series in 2006, more on that later. 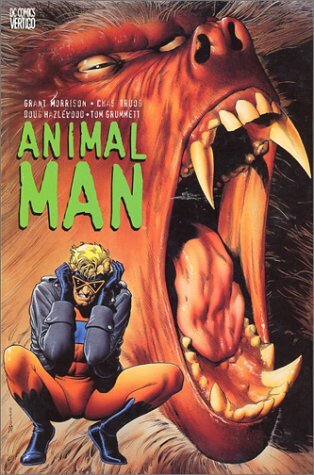 Animal Man was created decades before, in 1965 in Strange Adventures. The character could take on the abilities of what ever animal life was in the vicinity, so if a bird was around he could fly, if an elephant was close he could charge with massive strength, etc. The character was pretty flat an uninteresting, and even ironically became a member of a team called The Forgotten Heroes in the early 1980s. It was in the late 1980s, that the young upstart Morrison, newly imported from the UK was given the character. DC deemed it fairly safe to test the young writer out on a superhero with little fanbase invested in him, so if he screwed up it wouldn’t cause very much damage. 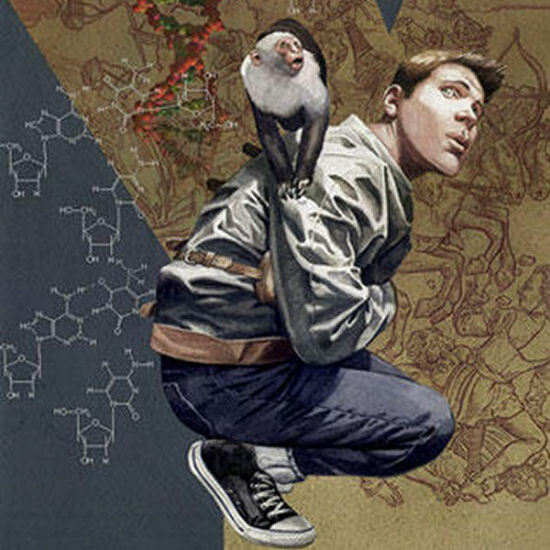 What Morrison managed to do was turn Animal Man into one of the most complex and interesting characters DC published. The character continues on in popularity, having been a major player in events in the last five years, as well as getting his own eight issue mini-series. Morrison began things by making Buddy Baker, the civilian identity of Animal Man, a family man. He had a wife, Ellen, and two kids, Cliff and Maxine. In the first story arc of the series, Buddy become involved in a battle between fellow animal-linked hero B’Wana Beast and a company using animals for scientific testing. The story is dark and poignant and there aren’t your typical hero versus villain battles. B’Wana Beast dies and Buddy is changed significantly. In resulting stories he goes vegan, his powers now linked to the emotional spectrum of animals, feeling their suffering. Morrison doesn’t let him get away with this easily, and Buddy ends up in some heated arguments with Ellen who doesn’t appreciate Buddy forcing his personal lifestyle change on the rest of the family. As you can tell, this is not the sort of thing you expect from comic books and its incredibly refreshing. The most mind blowing story up this point came in Animal Man #5, “The Coyote Gospel”. In this story, a humanoid coyote wanders the desolate roads of the American southwest. He’s hunted by an obsessive truck driver who kills him, only for the coyote to rise from the dead again and again. Animal Man, who plays a very backseat role in this story, shows up and the coyote hands him a scroll. The story shifts to the content of the scroll which explains that this coyote came from a universe very much like that of the Warner Brothers cartoons. The inhabitants lived in a state of un-death, dying but constantly ressurecting. This coyote finally became fed up and question his world’s creator. The creator, depicted as a man in a plaid pants and wielding a paintbrush condemned the coyote to wander other worlds. Morrison pulls us back to show that to Animal Man’s eyes the scroll is unintelligible chicken scratch. He tells the coyote that he can’t read this and at that moment the trucker fires, shooting the coyote point blank in the head and killing him. The final full page panel is off a hand drawing this scene which has faded away partially at the bottom as just a simple pencil sketch. This single issue serves as the thesis statement for the rest of Morrison’s run on the series. He begins to deconstruct the ideas of continuity in comics and how Animal Man’s original creator and his own intentions for the character are drastically different. Morrison looks at the idea of the multiverse and about what happens to comic book characters who are forgotten and never used. All of this culminates in a meeting between Animal Man and Morrison himself. What also has to be one of the trippiest moments in comics books occurs during this run, as Animal Man has gone to a mountaintop and taken peyote in an attempt to break free from the physical constraits of his universe. In this moment, he suddenly feels that he is being watched, then looks right up at the reader, shouting that he can see you, that he knows you are watching. Chills! As further reading, Brian Azzarello and Cliff Chiang got together for a very small series of back up stories in the mini-series Tales of the Unexpected (2006). Much like Morrison’s stories, these explore the nature of forgotten characters and their relationship with their creators. The series is a lot of fun and features some crazy characters (Genius Jones, Infectious Lass, The Gorilla Brigade) as well as poking fun at DC’s editorial staff. It’s available in a collected edition titled Architecture and Morality. Hal Jordan was now the Green Lantern of Earth again. 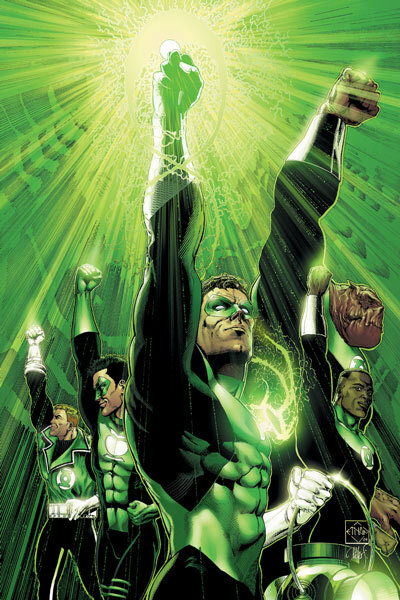 Kyle Rayner was still Ion, containing the power of the Green Lanterns without needing a ring to wield it. Guy Gardner and John Stewart were both Lanterns again and lived on Oa, the homeworld of the Green Lantern Corps training new recruits. Things were good. What they didn’t know is that Sinestro was busy in the Anti-Matter Universe, forcing the Weaponeers to construct a massive Yellow Lantern, which mimics the Central Battery on Oa, where the green power came from. With his own yellow battery, Sinestro created multiple rings sending them out to those beings in the universe that inspired great fear. 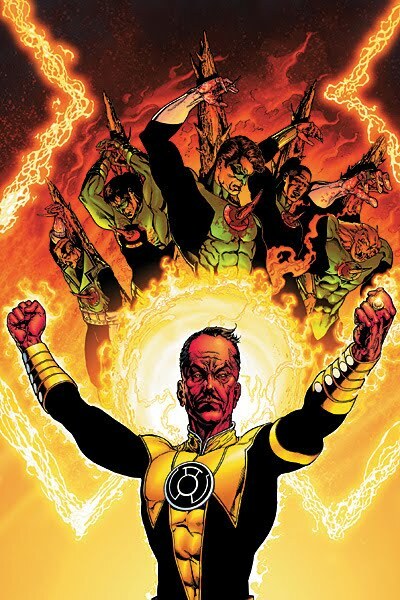 Once his Sinestro Corps was assembled, they led a brutal assault on Oa, killing many Green Lanterns in the process. The battle was unlike anything the universe has ever seen and raged on to eventually come to Earth. Kyle Rayner was stripped of his Ion powers, but managed to get a ring in time to join the Corps. Sinestro was captured, but not before the Guardians allowed the Lanterns to compromise their values and use their rings to kill. Sinestro was locked up in Sciencell on Oa but told Jordan that the “Blackest Night” was coming, and in this time of darkness Jordan would be compromised. Jordan was shaken up but worked to distract himself. The Guardians adapted to the new threat of the yellow rings of fear but establishing the Alpha Lanterns, regular Corpsmen transformed into emotionless judges, meant to keep the Corps in check. Meanwhile, other rings created from different aspects of emotion were manifesting in the universe. In Sector 666, the demonic Atrocitus vomited up a bloody red ring of rage. On a distant serene planet, two rebel Guardians made blue rings of hope. On the all-female world of Zamaron, its inhabitants made violet rings of love. And deep in a cavern on Okaara, one lone figure clutched an orange ring of greed. All of these various Corps began to get into conflicts and change the dynamics of the universe. In the Anti-Matter Universe, a jet black lantern manifest black rings of death, and these would change everything. While the Corps worked to hunt down Sinestro’s soldiers still out there, using their rings to torture innocent beings, Hal Jordan encountered the Blue Lanterns and found his could use his green ring in conjunction with a blue one. He also ended up in Sector 666, where a red ring of rage overtook him for a little while. Sinestro was being transferred when his Corps arrived to liberate him and all hell broke loose. The War of Light began, all the various colors battling each other. As they were distracted, an old villain named Black Hand brought the scourge of the Black Rings to Earth. These rings were keyed only to the dead, and allowed hordes of dead heroes and villains to be resurrected as dark versions of themselves. At the time characters like Aquaman, Martian Manhunter, and Hawkman were all dead and came back as monstrous Black Lanterns. After a few days of fruitless battle, the Black Lanterns merely reconstructing themselves, its discovered that if two Lanterns of different colors use their powers together they can destroy a Black Lantern. 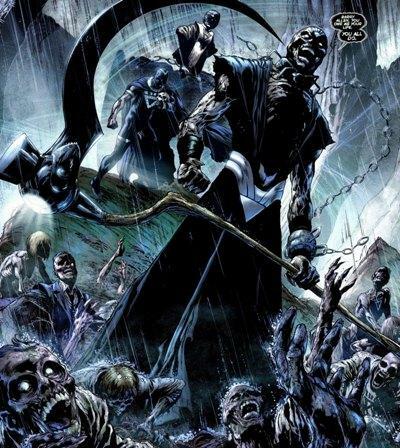 Across the globe the battle rages and its revealed that Nekron, a being who controls death has been making the rings. It’s also discovered that an entity lives in the Earth who generates a White energy that creates a single ring and single Lantern. 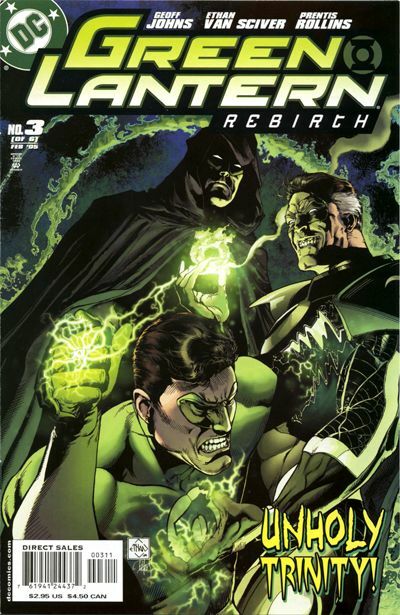 Sinestro gets ahold of it and fails, with Hal using its power to drive Nekron and the Black Lanterns away. Before the White Lantern vanishes, it resurrects a handful of heroes and villains. Through battle, Hal and Sinestro have reached a tentative alliance. Currently, Hal and girlfriend Carol (now wielding a Violet ring) have discovered that the Red Lantern, Atrocitus is on Earth looking for the source of his rage power. The White Lantern has also reappeared in New Mexico, forming a crater where it landed, and much like the sword in the stone is immovable. In Comics 101 I breakdown a comic character’s back history in an easy to understand way for newbies. The story of Green Lantern began in 1940 with Alan Scott. Unlike the latter and more long running Green Lantern, Scott was based in mysticism and magic. He is a railroad engineer at the time and discovers a mysterious green lantern that imbues him with a magic ring. The ring gives him the power to fly as well as manifest constructs from it. Scott ended up being a founding member of the Justice Society of America, a World War II era precursor to the Justice League. He also had two children out of wedlock, Todd and Jennie who would grow up to be the super heroes Obsidian and Jade, respectively. Scott is still around, as a member of the JSA, and partnered with his old pals plus some new blood. But the core of the Green Lantern story really began in 1959. In the late 1950s, the Silver Age of Comic Books began. DC has sort of pulled back its superhero publishing, with Superman, Batman, and Wonder Woman being about the only remainders. Julius Schwartz, the editor in chief at the time was wanting to take names used by heroes back in the 1930s and 40s and create all-new characters around them. This time around, Green Lantern was to be ace pilot Hal Jordan. While testing an experimental craft for his employer Ferris Air, Hal was pulled by a mysterious force to a crash site in the middle of the desert. There lay a dying alien wearing a strange green and black uniform. His name was Abin Sur and he told Hal he was part of the Green Lantern Corps, an intergalactic police force. Sur was dying as a result of the crash and Hal was deemed the only one on Earth worthy to wield the ring. Hal accepted and became Earth’s Green Lantern. The ring held 24 hours worth of energy and would have to be recharged in an accompanying lantern. The only catch in its seemingly invulnerable power was an impurity that made it vulnerable to the color yellow in spectrum. Hal would go on to battle a cavalcade of odd 60s appropriate villains, but his arch-nemesis would always be Sinestro. Sinestro was also a Green Lantern, but unlike Hal, he saw his place as using the ring to control the population of his home planet Krougar. The masters of the Green Lantern Corps were known as the Guardians of the Universe, small blue skinned men whom demanded total submission from all the Corpsmen. 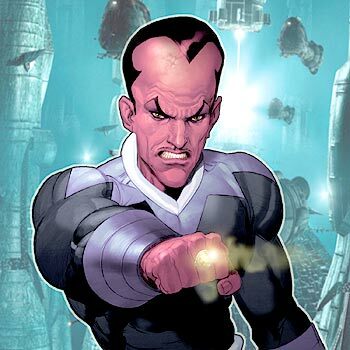 Sinestro and the Guardians clashed and as a result he was stripped of his ring. Enraged that this power would be taken from him, Sinestro sought out other sources. He found a way into the Anti-Matter Universe, a sort of reality underneath our own and home to the Weaponeers. The Weaponeers constructed a new ring for Sinestro, a yellow ring that specifically affected the power of the Green Lanterns. While the green ring used the aspect of Will, the yellow ring tapped into Fear to feed itself. For years, Sinestro plagued Hal Jordan and was eventually killed. Along the way, other Earthmen took up the ring. Hal would become increasingly annoyed with the Guardians dictates and leave the Corps. In time social worker Guy Gardner became a Green Lantern, as well as architect John Stewart. Hal also befriended many of the alien Corpsmen: Kilowog, a lumbering brute, Tomar-Re, one of the most noble of the Lanterns, Salaak, a typically annoyed and distant being, and Arisia, a young girl whose family were a long line of Lanterns. Things went dark when Hal’s home town of Coast City was attacked by Mongul, an alien warlord. Mongul’s massive engine city/ship destroyed the city and killed everyone there. Hal became obsessed with using his power to fix things, rebuild Coast City. This obsession led him into madness and he began to kill other Green Lanterns to amass a large collection of rings. The Guardians were desperate to stop him and resurrected Sinestro. The two old enemies clashed and in the end the Guardians, the GL Corps, Hal, and Sinestro were obliterated. Except for one solitary ring. This ring found its way to Earth and into the hands of young artist Kyle Rayner. Unlike Hal, Rayner had no one to teach him how to use the ring so he underwent a lot of trial and error. In time, he joined the Justice League and established himself as the one true Lantern. Hal returned as a villain, Parallax, infused with an almost infinite power. Parallax attempted to destroy reality and recreate it in his own image but the heroes of the DC Universe stopped him. He returned once more when Earth’s sun was being devoured by an alien Suneater. Making the ultimate sacrifice and redeeming himself, Parallax flew into the sun, reigniting it. He was rewarded for this act of bravery and made The Spectre, the manifestation of God’s wrath. Kyle Rayner continued on as the Green Lantern and eventually unlocked a power in his ring that turned him into a being called Ion, a sort of pure manifestation of the Green power. Things changed suddenly when Kyle crashed to earth, after having been missing in space for a few months. Along with this, Coast City suddenly appeared rebuilt. 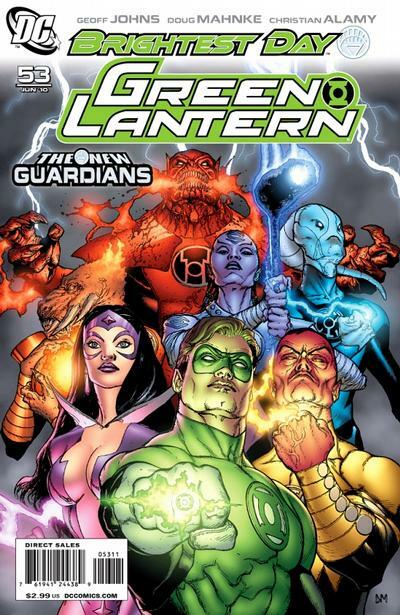 All of Earth’s former Lanterns (Guy Gardner, John Stewart, and even Alan Scott) became involved as Hal Jordan was reborn, as well as The Guardians of the Universe and all of the dead Corpsmen. It turns out that the source of the rings’ power was a cosmic entity known as Ion, while Sinestro’s ring was powered by Parallax. The Lanterns battle the now unleashed Parallax entity while Sinestro returns from the dead. In the end the Corps is restored, but Sinestro returns to the Anti-Matter Universe with some big bad plans for the Green Lanterns…. This blog is intended to be mostly for people unfamiliar with comic books and what’s out there. I know some friends who read Watchmen for a college English class or people who may not be up to date on the newer series out. For those of you not too up to date, DC Comics has an imprint called Vertigo which specializes in non-superhero fare aimed at adults or adolescents with literary maturity. Most of the time the series their present are great, a few seem to fall flat. 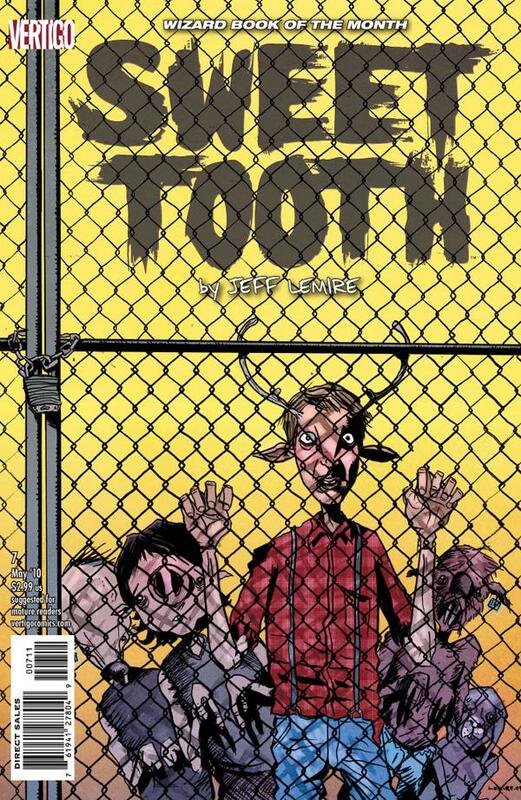 Sweet Tooth is very much the former. It’s a post-apocalyptic story about mutants and survival and humanity becoming incredibly tribal. The art style increases the uneasy feeling you’re meant to have reading that this scary and violent world. And its all the work of Jeff Lemire, recently signed as an exclusive creator for DC Comics. Gus is 9 years old and lives with Pa in the middle of the forest. He’s never left the forest and Pa has warned him that outside of it is all the evils in the world, and if Gus doesn’t want to go to Hell he’ll stay put. Then Pa dies and Gus is left alone in the world, slowly running out of food in their desolate cabin. Then one day some men enter the woods carrying guns, and when they see Gus they know they have found something special. You see, Gus has a pair of deer antler growing from his head. His mother died in childbirth and Pa ran away with Gus to keep him safe. The hunter surround the little boy but he is saved by Tommy, a lone mercenary who becomes Gus’ protector. The duo set off to a place Tommy says will be safe for Gus. Along the way they encounter roving bands of killers and thieves that populate the now devastated American Midwest. Sweet Tooth is a slow burn, and its perfect that way. Almost one year in and we still know very little of the mystery behind Gus. We know that his mutation is one of many that occurred as a result of a virus that killed millions. All the children born in the wake of the virus had animal mutations. There’s even a brothel they run across where a few women dress in animal masks to satisfy the cravings of some of the more perverted clientèle. The environments in the comic are very wide and very open, because its the Midwest it was already like that, but the apocalyptic air increases it a million times. 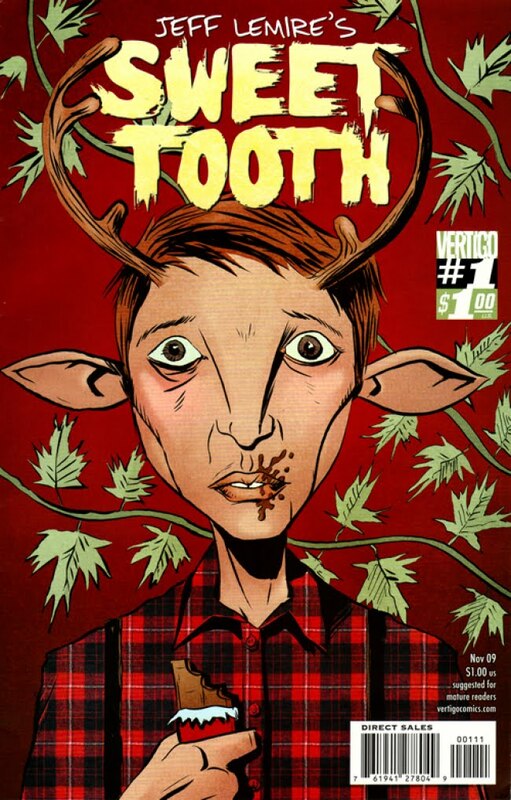 The artwork in Sweet Tooth is incredibly aesthetically inventive. In one of the more recent issues, Gus is put under hypnosis to pull out his memories of his life in the woods. The way Lemire stages is this is by miniature versions of Gus and the hypnotist walking along the full size Gus’ head, crawling into and out of his ears. It runs through the entire issue and is just one example of the creativity and interesting storytelling at work. This is a very easy one to get caught up on. Only two collections out right now so you could be ready to follow it month to month by catching up in day. A series that I am looking forward to seeing where it goes. When I was eight I met a Justice League that was a complete stranger to me. I grew up watching the Super Friends and from what I could tell they were the Justice League also. Imagine my surprise when I picked up Justice League America #42 and found characters like Blue Beetle, The Huntress, and Mister Miracle among others. Even though these were not the people I was expecting, I was intrigued. Later, in my first two years of college I was able to track down a complete run of this Justice League through dollar boxes, all sixty issues of Keith Giffen and J.M. DeMatteis’ Justice League/International/America. The series went through some title changes but it was always the League to me. DC has recently gotten this ragtag group of heroes back together again for a bi-weekly 26 issues series that has their former benefactor leading them on a global wild goose chase. So how do the first five issues bode for the series so far? Maxwell went a little evil, ended up trying to kill earth’s heroes, and Wonder Woman was forced to kill him. But, as is the way in the world of comics, the dead don’t stay dead. Max was resurrected during one of those big cross company events and immediately set about causing trouble. Max had an ability to manipulate the minds of others and now he knew he would be the most hunted man alive. Using considerable effort and straining his body beyond its natural limits, Max erased his memory from the mind of almost every living being on earth, except for his old Justice League crew. Now they are hunting him down, with the world around them believing they are crazy, attempt to stop Max before accomplishes what ever it is he’s up to now. So far the first five issues have had their ups and downs. 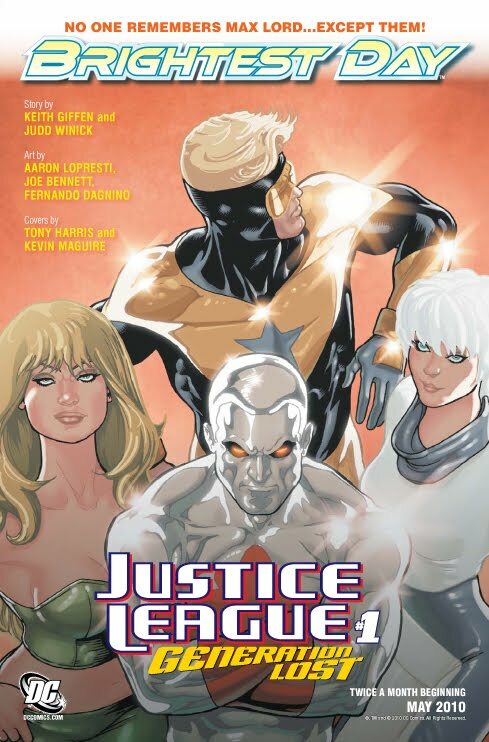 While DC brought back the original plotter of this Justice League, Keith Giffen, they paired him with Judd Winick, a writer whose work is some of my least favorite ever put to paper. Winick has a very grating way of writing and is not very good when it comes to handling action. Shouldn’t be a problem with a Justice League that was always more about the humor than the action. Once again he fails, nothing is funny and the characters are way too serious. The thing that always drew me to the Giffen/DeMatteis League was that unlike the Silver Age goofy JLA or the cosmic trippy Morrison JLA, theirs felt like people having fun. Blue Beetle and Booster Gold are my all-time favorite comic book duo. It was like a great comedy team and super heroes rolled into one. They frequently used Max’s funds to invest in get rick quick schemes or antagonized the team’s token Green Lantern, Guy Gardner. Now Ted Kord is dead and replaced with Jaime Reyes, the new Blue Beetle. He’s an equally interesting character but there is something lost in the dynamic. Because of the extended 26 issue story these first five feel like nothing has happened, and really it hasn’t. We’ve seen the characters assemble and some battles that seemed very pointless occur. The only part you could really call plot development would be that the heroes have realized Max has manipulated them into reuniting and that Max seems to have some unwanted side affects to his resurrection. The artwork is also back and forth, as to be expected in a series that comes out more than once a month. Three artists have been employed rotating, the best of which has been Aaron Lopresti on the first and most recent issues. He just a cleaner, more detailed style than the other two. What’s impressive is that DC’s last foray into publishing a title more than once a month was Trinity, a 52 issue weekly series with Mark Bagley handling art on every single issue without a miss. And it was better than this series, which has multiple hands to choose from. Overall, my excitement for this series before it was released has really waned. You’d be better off checking out the collected volumes of Giffen and DeMatteis’ original Justice League run which is up to four volumes so far. 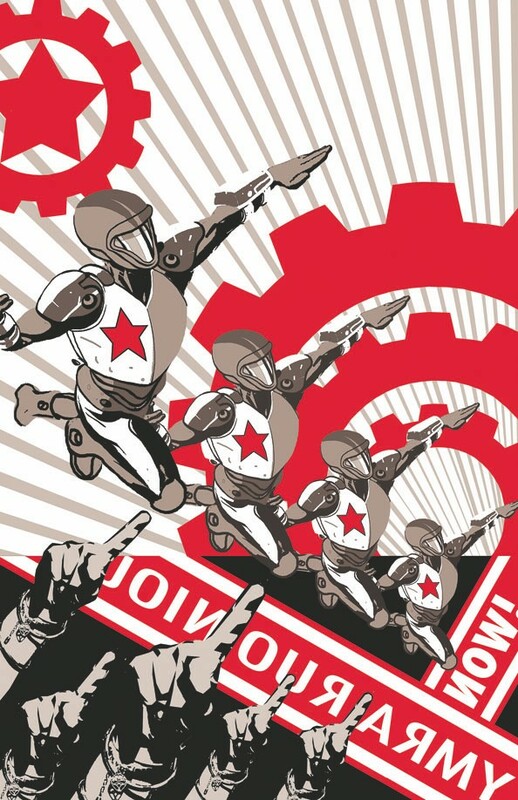 Here’s hoping The Lost Generation can pick momentum in the next twenty-one issues.